Almost two years ago (is it really so long ago?) the builders moved in to renovate our 20 year old block of apartments. I should have known when the first victim lost its life the shape of things to come. they removed some of the hedge to make a wider path to enter with the various scaffolding parts and diggers. I heard a scream (not really) but I am sure my first Spring daffodil was suffering as the first victim when it was brutally broken down by the weight of a builder’s boot. I took a photo of the victim, but to no avail. The builder did not even notice the irreparable damage he had caused: after all what is a daffodil. 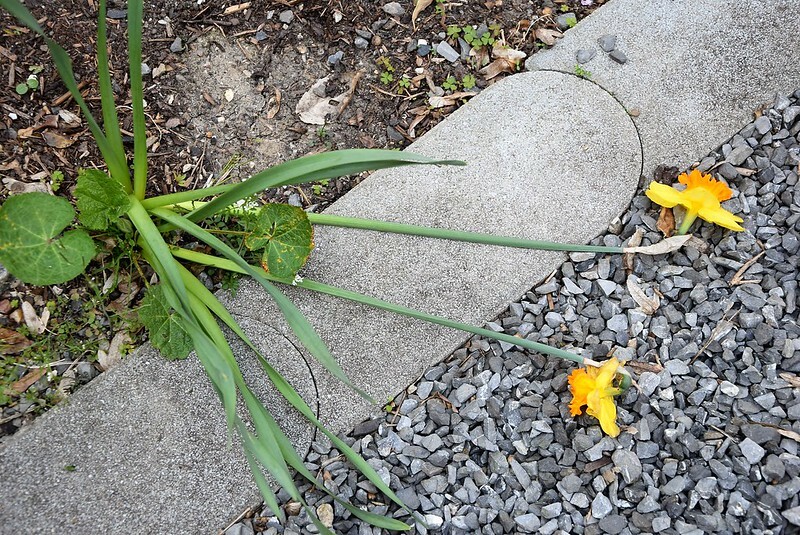 But a daffodil ever gives up and last year it appeared again in the same place. The builders have moved on to other sites to wreak havoc on the first breath of Spring, but my experience will forever remain in my photographic memory. Somewhere under the tons of snow, there are crocuses. Well, maybe not anymore. It’s very cold, the snow is deep, and crocuses are small and fragile. Murdered by our fake spring weather! Is the boot more merciful? Oh, I so know how it is. I work with a crew of other professionals (who work in other professions), and I am SO fortunate that they respect my work, sometimes almost too much. I sometimes go to their sites to tell them it is okay to remove certain shrubbery if it is in their way. They rarely trample flowers, but I can not complain. They are such an excellent crew. Generally, but my crew does.